Update 3:10: Joe Christensen said (via his Twitter page) that the Twins are done trading. They worked on deals for Heath Bell, Jon Rauch and Mike Wuertz up until the deadline. He also said that the predicted roster move for Cabrera is to send Alexi Casilla to Triple-A. But since Cabrera is not expected to be in the lineup until tomorrow, that could very well change overnight. As has been reported here already, the Minnesota Twins and Oakland Athletics have agreed to a trade that will send Orlando Cabrera to the Twins in exchange for Tyler Ladendorf. The original asking price was thought to be Danny Valencia, so the fact the Twins got Cabrera in exchange for Ladendorf speaks volume of the market for the 34-year-old shortstop Cabrera. Breakdown: The Twins selected Tyler Ladendorf in the second round of the 2008 draft. Heading into the draft, he was regarded as one of the best JUCO players in the country. He hit .542 with 29 doubles, 5 triples, 16 home runs and 83 RBI in 53 games his Sophomore season at Howard College. He has a lot of pop in his bat, unfortunately he struggled in his first go-around in pro ball which is why he is ranked this low. He has a good glove and is a solid all-around player. Some believe that he may have to move to third base eventually, but at this time he's going to be used as a shortstop. I like Ladendorf a lot and I think that his good defense and strong eye at the plate may give the Twins a reason to move him to Beloit after 175 disappointing plate appearances in the GCL. If he struggles in Spring Training, he will probably be held in Extended Spring Training and will later head to Elizabethton, but if he succeeds, he could be in Beloit on opening day. Note: In case you missed it, Ladendorf also was kind enough to answer a few questions for the site last summer. But Ladendorf started turning heads early this summer, hitting .410/.500/.721 with the Elizabethton Twins through 61 at-bats. He was then promoted to Single-A to help a horrid Beloit Snappers lineup and Ladendorf came back down to earth and hit .233/.292/.267 through 60 at-bats with the Snappers. But still, his early success this season inflated his value enough for the Twins to convince the A's (as if they truly needed to convince them) that Ladendorf was the best they'd be getting for Cabrera. And from the A's perspective, they should be thrilled they even got Cabrera considering it seemed as though it was the Twins or bust for Cabrera. Ladendorf mixes in good speed, good arm/glove and power in a strong frame. But if he gets much bigger, he projects to be a third baseman in the future. And I do agree with La Velle Neal on what he said regarding losing Ladendorf. If the Twins had a hard time giving up Ladendorf, sign Miguel Angel Sano to replace him. By all reports, Sano is a much better prospect (obviously, nobody is going to sign him until they figure everything out with his contract). "Comments I have heard from other Twins bloggers is that the deal is not going to make the Twins better, but simply to appease the players. With the Mauer situation, that is not a minor thing." And he's completely right. The Twins players have been hoping for an acquisition like this and with Joe Mauer's future in Minnesota still unknown, this sends a good message to the him and the rest of the team. Is it enough to get Mauer to stay? Obviously this alone won't do it. But it should help the Twins get some leverage when even an ounce of leverage in contract talks with a superstar is a much-needed bonus. The A's are also sending the Twins cash in the deal. While that may not seem like anything on the surface, I do think it might have legs. 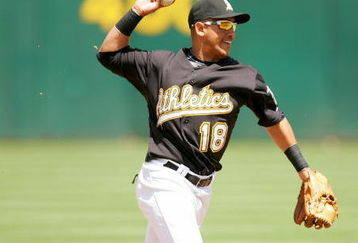 Could the Twins have gotten Cabrera for much less than Ladendorf had the A's not chipped in money? Perhaps the A's insisted, but it does fit the Twins' M.O. of asking another team to pick up some of a player's salary. And with that said, with the trade deadline now drawing to the close. The window of opportunity to add another player is dwindling fast and although even one move comes as a slight surprise, it'd still be nice to see the Twins add a pitcher. With Jarrod Washburn going to Detroit for a couple of mediocre prospects, it's not unrealistic to believe the Twins could get Jon Garland or Doug Davis (among others) for less. Pitching is an even bigger need than the middle infield, so I'm still hoping the Twins can quickly put something together. Update 12:20 PM: It has been confirmed. The Twins have traded 21-year-old Tyler Ladendorf for 34-year-old Orlando Cabrera. I like this move a lot for both teams. The Twins get 'their guy' while the A's get a promising prospect. The Twins have reportedly acquired Orlando Cabrera from the Oakland Athletics in exchange for shortstop prospect Tyler Ladendorf. On first thought, I think it's a fair trade. While Ladendorf is a promising young prospect, he's not a "Top Prospect" and this should please the players. Stay tuned as we hear more developments. According to multiple sources on Thursday night, the Minnesota Twins and Oakland Athletics have made a lot of progress in trade talks that would send 34-year-old Orlando Cabrera to Minnesota in exchange for what is believed to be a prospect. Earlier this week we learned that the A's had asked for top prospect Danny Valencia in return for Cabrera which the Twins rightfully scoffed at. Valencia, as it turns out, has been a popular name thrown out by other teams this week with the Pittsburgh Pirates also asking for the talented third baseman in a trade for All-Star second baseman Freddy Sanchez. Sanchez is a far better player than Cabrera, so if the Twins refused to include Valencia in a trade for Sanchez, I doubt they'd finally feel compelled to include him in a deal for Cabrera. At least, that's my hope. The more likely scenario is that the A's have lowered their asking price for Cabrera. On Thursday morning, Daniel Barbarisi of the Providence Journal reported that the Boston Red Sox turned down an offer for Cabrera which would have sent a 27-year-old minor league reliever in Fernando Cabrera and 26-year-old first baseman/outfielder Chris Carter to Oakland in exchange for (Orlando) Cabrera. While both (Fernando) Cabrera and Carter aren't terrible players, they do have less value than Valencia. As I said earlier this week, if it's the right deal, Cabrera might be a solid pickup. While I do see him as a slight upgrade (again, I want to put emphasis on the word slight), I don't see him playing a huge difference on the overall outcome of the season. With potential suitors looking unlikely to deal top talent for Cabrera, the A's now sound as though they're at the point that they'll 'take anything they can get' for Cabrera. While that's probably a little misleading, as the Twins will probably still have to surrender a quality prospect to get Cabrera in return, but it certainly sounds as though their 'top prospects' are off-limits, which they should be. One intersting thing to note is that the Twins have also been linked to Oakland reliever Michael Wuertz and Adam Kennedy. Wuertz is believed to be staying in Oakland while Kennedy is a free agent after the season and has recently been linked to the Twins. The A's want to keep Kennedy, but I'm sure if the right deal came along, they would trade him too. Unfortunately, the A's ask for top talent in return for their players so my hopes of the Twins nabbing both Kennedy and Cabrera is more or less a pipedream. I'll try to update anything that happens throughout the day. The deadline for non-waiver trades is 3:00 PM CT this afternoon. Stay tuned. Update 1:00 PM: La Velle Neal of the Minneapolis Star-Tribune is reporting that the Pirates wanted either Aaron Hicks or Danny Valencia in a trade for Freddy Sanchez. I am happy Valencia wasn't traded but I would have been open to trading Hicks. Obviously we wouldn't have gotten more than Sanchez for Hicks, but if the Twins could have traded Hicks in a package for Sanchez and one of Matt Capps/Ian Snell/John Grabow or Jack Wilson, I would have been very pleased. Regardless, the Pirates did a great job of getting maximum return from the guys they traded. And honestly, I can't argue if the Twins wouldn't trade their top prospect for him. They Pirates were obviously looking for quality over quantity, which is something most of us never look into. Update 8:00 PM: Freddy Sanchez was traded to the San Francisco Giants for Tim Alderson. Steep price to pay, I'm not sure what they wanted from the Twins but I bet it was a lot. Update 2:05 PM: Joel Sherman of the New York Post's Hardball is reporting via his Twitter page that a source has told him that the Giants are "definitely getting Sanchez." It sounds like the Giants and Pirates are close on a trade involving Freddy Sanchez. Along with the Giants, the Twins have also expressed great interest in Sanchez. Unfortunately, the Pirates and Giants are currently facing each other in San Francisco which gives the two teams a chance to talk face-to-face and hammer out a deal. It's no secret that Sanchez is essentially the perfect fit for the Twins. He hits left-handed pitchers at a very high clip, he plays at a position of real weakness and is a perfect number two hitter. Even though he's owed $8 million next season, it's well within the Twins' 'budget' that they should be fielding upon entering their first season at Target Field. But with the Giants being in the mix all along and now look to be pulling away with it, the Twins could be left in the dust. Thankfully, there are several alternatives the Twins could look into in case Sanchez is in fact dealt to another team. Marco Scutaro has been mentioned. His salary isn't a problem and he's reportedly available, but the Twins have been told that he's probably not going to be traded until the Toronto Blue Jays decide the fate of Roy Halladay. The 33-year-old is putting up career numbers and although he's likely a 2-month fix only, he is currently projected to be a Type-A free agent meaning he'd bring the Twins a draft pick if he signs with another club. He currently leads off, but he'd be a great #2 hitter. He draws a lot of walks which in turn has helped him have a .388 on-base percentage this season. Having a player that gets on base and can still hit in front of Mauer would be a great asset. Orlando Cabrera has also been mentioned. Cabrera isn't a great fit but I do see him as a slight (key word) upgrade. Cabrera is due around $1.5 million for the rest of the season, which is not a problem at all. The problem is that the Athletics have reportedly asked for Danny Valencia in return, which is not something the Twins are going to be doing. The Twins have also looked at trade options that would land them both Cabrera and A's reliever Mike Wuertz, but I still don't think they'd include Valencia in a trade for both of them. It continues to become more and more clear that the A's might not be the best trade partners. But if Sanchez or Scutaro fail, I think that there's another option that could be a potential fit, at least more so than Cabrera. 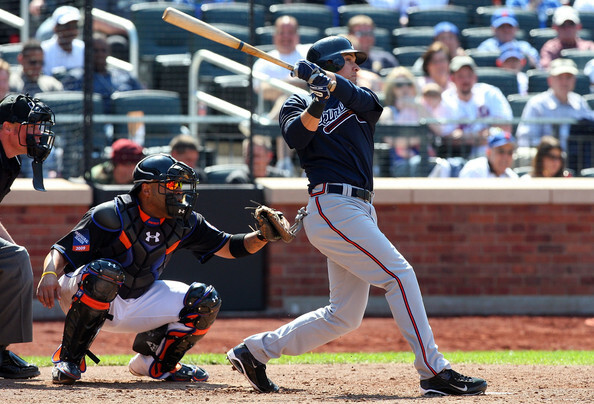 The Braves have grown sour of Kelly Johnson's streaky bat and mediocre defense. Obviously that's not a great selling point, but there's definitely a lot to like about Johnson. Although he's probably not a top-of-the-order bat, both his career OBP and SLG% are higher than Sanchez's. Sanchez mashes left-handers, and while Johnson's numbers aren't as appealing, he does hit left-handed pitching much better than he hits right-handed pitching. He has power. Johnson is an extra-base hitting machine and while the Twins would like the stay heavy from the left side, he could have a bright future in a left-handed friendly environment like Minnesota. He's only 26-years-old and isn't eligible for free agency until 2012. Sanchez is 31-years-old and is due $8 million next season before becoming a free agent in 2011. Johnson has become the Delmon Young of the Braves, riding the bench for the majority of the time while starting just a couple times a week. With Martin Prado filling in adaquetly at second base, Johnson has become expendable and with the Braves desperately needing offense, the Twins could probably be a good fit for him. Johnson's value is at an all-time low and he's under team control for a few more years, he'd definitely be a good fit for the Twins if they're not able to work out another trade. Since the two teams met up in Oakland last week, the Twins and Athletics have been linked to trade talks surrounding shortstop Orlando Cabrera. Cabrera is a 34-year-old shortstop with declining defensive and offensive abilities. So naturally, he's an ideal fit (from the front office's perspective) for the Twins. Cabrera has spent time with the Montreal Expos, Boston Red Sox, Los Angeles Angels, Chicago White Sox and the Oakland Athletics over the span of 13 Major League seasons. He has two Gold Gloves and a World Series ring under his belt as well as a career triple-slash line of .274/.322/.397. This season, he's hitting well under his career hitting line and hasn't posted a league average OPS+ since there was still a team in Montreal. He is also having his worst defensive year of his career. So why would the Twins be interested in him? Because sadly, he's still a slight (and I'm talking fingernail length) upgrade over what we currently have. Brendan Harris has done an O.K. job of handling the everyday (well, almost everyday) duties of shortstop, but his inconsistent bat has been worrisome and has proven to be a better role player than everyday player. But unfortunately, it's either Harris or Nick Punto at shortstop. And in the midst of putting together his worst offensive season, yes even worse than 2007, he has also lost a lot of defensive value at shortstop. Punto in fact has been far better both offensively and defensively when he's playing second base. He's actually reached base safely 26 times out of 51 at-bats while playing second base, that's thanks in large part to the 13 walks he's collected. Cabrera has gained quite a bit of value in the past month-and-a-half due to his .362 average over that span. In fact, of the last 33 games he's played, only three have come without a hit. Over that span, his season average has jumped 43 points, his season OBP has jumped 31 points and his season SLG% has jumped 74 points. With no signs of slowing down, many teams have gained interest in Cabrera. Both on the season and in his career, Cabrera has hit better in the #2 spot than any other spot in the lineup. With Alexi Casilla now for the time being moved to the bottom of the order and with Ron Gardenhire's desire to place a middle infielder in the two spot, Cabrera would probably be a far better option than Punto, Harris or Casilla. In no way is he an ideal fit, but he is an upgrade. And while Cabrera's hitting line is getting close to his career average, his defense is not. He is second-to-last in the Major Leagues (for those who qualify) with a -9.3 UZR/150, which is much worse than both his UZR/150 of 13.1 last season and the 5.1 he has for hsi career. One thing does make this entire situation interesting though. While declining arbitration last fall from the Chicago White Sox, Cabrera had a hard time finding a new home because of the Type-A status the he carried with him. In order to sign him, a team would have to give up either their first round pick (if not in the top 15) or their second round pick. The only team willing to do so was the Oakland Athletics who surrendered their second round pick while signing Cabrera to a 1-year $4 million deal. In doing so, Cabrera and the Athletics came to an agreement that would prohibit the A's from offering him arbitration if he's a Type-A free agent in 2010 as well. According to the most recent Elias predictions, Cabrera (despite his overall poor season) is still considered a Type-A free agent, meaning the A's (or any other team he is on) won't be able to get anything from him at the end of the season if those rankings hold up. But even if he does fall into Type-B range, the Twins would have to be careful if they choose to offer arbitration to him, as he'd probably accept. He'll be 35-years-old in November and is having one of his worst overall seasons of his career. The market for a 35-year-old with diminishing defensive and offensive abilities is even worse than a 34-year-old with the same problems, so it's likely that he'd accept the Twins' offer of arbitration if he has desire to play next season. Even though a Type-B free agent won't require a team to surrender a draft pick, he probably still won't get much on the open market which means that the Twins' offer would probably be the best option for him. Should the Twins acquire Cabrera, that would probably end any dream anyone might have of landing Pirates second baseman Freddy Sanchez. Sanchez is a three-time All-Star with a career .301/.337/.759 hitting line. The Twins and Pirates have been linked as possible trade partners, but nothing has developed past the rumor-mill. Sanchez is due $8 million next season if his contract vests (which it is likely to do), which means that the Twins would be getting at least a year-and-a-half of Sanchez compared to just a few months of Cabrera. While Sanchez would undoubtedly cost more to acquire, he plays a good second base and is three years younger than Cabrera. And unlike Cabrera, he hits left-handed pitching extremely well. He has a career line of .355/390/.504 against southpaws, which would fit in nicely with the Twins who are hitting left-handers at a .277/.343/.433 clip. Despite that being better than the team's line against right-handers, the Twins have a left-handed dominant lineup which is in need of a few good right-handed batters. Sanchez would fit the bill perfectly. They also have Ian Snell who has been outstanding since his demotion to Triple-A. Snell has publicly criticized the Pirates and has stated that he doesn't want to return to Pittsburgh. He'd be a great option with the rotation in total disarray. Unfortunately, the Twins and Pirates don't appear to be close to a deal and with the Twins' own manager addressing Cabrera personally, it seems more and more likely that Sanchez is not going to happen. "I like Cabrera, yes. I'm not allowed to talk about players, but yes I like Cabrera. It's a direct question. I can answer a direct question. I think he's a great player." "Ozzie (Guillen) and he really butted heads. Crede told us he was a great teammate, hard worker. These guys over here said fantastic things about him, played the game, played hard, the whole package." Joe Crede and Cabrera played on the left-side of the White Sox infield last season. The two had a good relationship. Although Crede is "one of the new guys" he's known to be a good clubhouse guy and since we all know how Ozzie Guillen is, I believe Crede's assessment that he is a good teammate and hard worker. While I'm far from advocating for this trade to happen, I do see some reasons why the Twins would be interested in Cabrera. And although this isn't the trade I (or many others) had in mind, it does seem as though it might be a slight upgrade over what we already have. To me, it will all depend on what the Twins give up. Again, they're getting a 34-year-old shortstop with diminishing defensive and offensive abilities who is owed around $1.5 million from now and until the rest of the season. The Athletics might also be in a no-win situation with Cabrera. The team has no chance of contending this season and they already know they can't offer arbitration if he's a Type-A free agent. And if he's a Type-B free agent and they do happen to offer him arbitration, he could very well accept it. The A's shouldn't expect a ton from the Twins, while the Twins need to be careful to not overpay for Cabrera. To me, the thought of adding Cabrera doesn't bother me compared to the thought of what we'll give up to get him. Wowzers... I have a bunch! In light of last nights collapse, I figured this was the best time to post another Q&A. This time, it is with Tyler Robertson. Robertson is a 6'5'' southpaw who was drafted by the Twins in the third round of the 2006 draft. Despite a slight decline in strikeouts, Robertson has remained very effective throughout his career and has a 23-16 record with a 3.15 ERA throughout four Minor League seasons. Robertson has a great frame and although he doesn't have high velocity, he has a lot of movement on his pitches. According to "Future of Fantasy", Robertson compares most to Ted Lilly of the Chicago Cubs and Manny Parra of the Milwaukee Brewers. Josh's Thoughts: Who was your favorite player growing up? Did you have a favorite team or a team you followed more than others? Tyler Robertson: My favorite player was Randy Johnson. My favorite team was the Cleveland Indians. Josh's Thoughts: In high school, did you play any sports other than Baseball? Tyler Robertson: I played Football, Basketball, and Baseball. I loved Football. Josh's Thoughts: What team expressed most interest in you prior to the draft? How much contact did you have with the Twins? Tyler Robertson: The Twins were probably the team that expressed the most interest. Them and the Brewers. Josh's Thoughts: Do you ever pay attention to prospect rankings? Tyler Robertson: No, not really. I have seen them but really don't care too much. Josh's Thoughts: What kind of things do you do to prepare for each start? Do you have any superstitions? Tyler Robertson: No superstitions. Just really try to focus on my bullpens between starts. Josh's Thoughts: What does your repertoire consist of? Tyler Robertson: I Throw A Fastball, Curveball, Slider, and Changeup. Tyler Robertson: I would say location. Whatever pitch I am commanding the best at the time. Tyler Robertson: My Family has had the biggest influence. Tyler Robertson: To finish strong and get better every start. And to win a championship if we get the chance. Tyler Robertson: I like to shoot my guns, hunt, fish, hangout and relax. I also like to listen to music. Josh's Thoughts: What are your interests besides baseball? Tyler Robertson: My favorite music is country. I love movies, I have a DVD collection of about 400 movies. Josh's Thoughts: If you weren't playing baseball, what would you be doing? Tyler Roberston: I'd be playing college football. Tyler Robertson: The guys on the team call me all sorts of things. But 'Ty' is the most common though. Tyler Robertson: I like to watch Andy Pettite pitch. I don't know if we are really comparable though. Josh's Thoughts: What has been the best part of playing professional baseball? Tyler Robertson: The best part is getting paid to play baseball and do what you love. Tyler Robertson: I had some good memories in High School. And winning the Pitcher-Of-The-Month in Beloit was pretty cool too. Josh's Thoughts: You've excelled at each level of competition as a professional, but which jump has been the hardest (rookie ball to low-a or low-a to high-a)? Tyler Robertson: I would say probably Low-A to High-A. The hitters are just a little more selective. Tyler Robertson: Work hard and have fun with it, it's the best sport ever. And learn the game and play it the right way. Tyler Robertson: I Really Like Clearwater (Bright House Field). Josh's Thoughts: What do you think you will need to work on most between now and before you arrive in Minnesota? Tyler Robertson: Probably commanding all of my pitches is my biggest thing. Thanks again to Tyler for answering these questions. If you have any questions or comments, I'd love to hear them. Seth Stohs reported yesterday that the Twins and free agent second baseman Mark Grudzeilanek have agreed to terms on a Minor League contract. Grudzielanek will report to Ft. Myers where he'll work out a week or two before being placed somewhere in the system. Many Twins fans are split on this signing. While both sides are understanding, I do have to say I'm slightly on the 'pro' side of this argument. This will likely be the Twins' only move toward upgrading second base and possibly even the team. He's a career .290/.332/.395 hitter and has been best since he turned 33-years-old. He is a solid defender with a career UZR/150 of 8.8 at second base. He's cheap and doesn't require anything other than money to acquire. I don't for one minute believe that Grudzielanek is going to be a season-changing addition, but with the way Alexi Casilla and Nick Punto have played this season, I love this signing. Grudzielanek's OPS+ has been around league average for the past six seasons while Punto and Casilla's combined OPS+ this season would still be 23 points below Grudzielanek's from a season ago. I know, I know. Different season means different story, but even their career OPS+ numbers are still well below Grudzielanek's. Grudzielanek's defense is also something that should bring optimism to this signing. He has been one of the best defensive second basemen in baseball the past few years, something that the Twins can really use at second base if Brendan Harris continues to make starts at shortstop. Casilla is still (at least according to Bill Smith) the 'first choice', but he'll need to pick it up quickly if he expects to hold onto second base. He has just one hit in his first nine at-bats since being recalled, but he's not looking overwhelmingly better than what he looked prior to his demotion, which is what the Twins wanted to see. Obviously we need more than three games to make a proper assessment, but the Twins aren't going to give him a lot of time to clean up his act. I do hope that this isn't the only move the Twins make to improve our team but it wouldn't be out of the Twins' character for that to be reality. The Twins have (in the past) been attracted to several older veterans at the trade deadline (Phil Nevin and Brett Boone to name a few), but they've failed to bring in players of real value. While I have more confidence in Grudzielanek than I ever did in Nevin or Boone, I do think that this is not going to be a season-changing move. And while the Twins add Grudzielanek, the conventional thought is that Freddy Sanchez is now off the radar. While that is probably true, at least it does put (a little) less pressure on the Twins to make a move for either Sanchez or another second baseman. If they do make another deal, Grudzielanek's services could be used elsewhere throughout the system. One thing is almost certain though, it puts more priority on adding bullpen help. Several names have been linked to the Twins and there seems to be plenty of relief help available. I do have one problem with acquiring bullpen help in that at the trade deadline, it's at such a high demand that teams will often overpay for relievers. But while the bullpen seems to have gotten better almost each month this season, there is still room for improvement. I hope this isn't the only move the Twins make, but I wouldn't be surprised. While it's easy to dislike this move, I can't help but like it because of how poor both our second basemen and #2 hitters have been this season. I have to limit my expectations on Grudzielanek, but I do think this is an imiprovement. The Twins drafted David Bromberg in the 32nd round of the 2005 draft. He grew up near Santa Monica, California where he attended both Palisades High School and Santa Ana College. If dominating both the Gulf Coast League and Appalachian League wasn't enough, he followed up his impressive 2006 and 2007 seasons by leading all of the Minor Leagues with 177 strikeouts in 2008. This season, he's not on track to lead the Minor Leagues in strikeouts, he's still having an equally impressive season. He currently sits at 7-0 with a 2.87 ERA in 17 games (16 starts) this season. He followed up his 2008 All-Star selection with another All-Star selection in 2009 in which he started in. He has both a projectable build and repertoire that makes him a high-ceiling prospect. Bromberg is a pitcher that Twins fans should get to know and follow as he continues to progress through the Minor Leagues. Josh's Thoughts: Growing up near Los Angeles, I have to ask, Angels or Dodgers? David Bromberg: I was a Dodgers fan. Josh's Thoughts: Did you play any other sports in high school? David Bromberg: I played football until 10th grade and then my baseball coach said "no more football, concentrate on baseball." Josh's Thoughts: Before you were drafted, how much contact did you have with the Twins? David Bromberg: The scout who drafted me was Dan Cox and we kept in touch a lot. Josh's Thoughts: You attended Santa Ana CC while signing as a 'draft and follow.' Do you feel that a brief stint in college helped you as a pitcher? Would you recommend players to play some college baseball before going professional? David Bromberg: Yes I did a draft and follow at Santa Ana, and I needed some more work before the pros because I graduated at 17 so I thought I needed another year. It payed off for me because I got some good help and got to play for one of the best managers in junior college, Don Sneddon. David Bromberg: Preparing for a start I visualize my innings in my head and making sure they're positive. I also listen to music to get in the zone. David Bromberg: My favorite music is Rock, Rap and R&B. Josh's Thoughts: What's the velocity on your fastball? Do you pay a lot of attention to velocity? David Bromberg: On average, I touch 91... 93, 94 sometimes 95 if I'm feeling good. But when you play pro ball, you can't always think of velocity because you see in the Majors, 98 gets hit around if it is straight. David Bromberg: My out pitch would have to be either my slurve or slider. If the hitter is late on my fastball I stay with my fastball and locate a 3 or 4 spot. David Bromberg: The biggest influences have been my dad and my high school baseball coach Tom Seyler. He helped me with all of my distractions and helped me out with my career, getting me to play professional, working with me after we were done with practice and my dad has been their for me my whole life. Josh's Thoughts: Who were your favorite players growing up? Do you have a favorite player now? David Bromberg: My favorite players were Roger Clemens, Ken Griffey Jr., Barry Bonds, Torii Hunter and Bobby Jenks. Right now it's Josh Beckett. I love the way he pitches when he dominates. David Bromberg: My goal is to stay healthy, work on my fastball command, work on my change up and just getting outs. And most importantly, winning a championship this year with the Fort Myers Miracle. David Bromberg: In my free time, I like watching movies, working out, hanging out with Ben Revere and the guys on my team. I also like to go out on the weekends. David Bromberg: My profession is baseball and I dont think of any other things except for playing baseball and making a living out of it. David Bromberg: People will be shocked by how good I can swing the bat. They know I'm a pitcher but don't know about my skills with the bat. David Bromberg: I would compare myself to Roger Clemens and Josh Beckett. It's just the way they cary themselves on the mound and field and how dominating they are. Josh's Thoughts: What has been the most difficult part of pro baseball? Best part? David Bromberg: The most difficult part of baseball is learning how to overcome failing. Like having a bad start and getting back in the bullpen and working harder and forgetting about my last start. I am getting better at it though and I am working hard everyday and it is paying off. Best part is all the awards I have won from my hard work and great seasons. David Bromberg: Winning the Appy-League Championship my 2nd year while I was in Elizabethton, Tennessee. Josh's Thoughts: Which jump has been harder, Rookie Ball to Low-A or Low-A to High-A? David Bromberg: I would say Low-A to High-A because the hitters are more patient and don't swing at everything with 2 strikes to get an out or a strikeout. David Bromberg: I would tell him to never be satisfied and work hard everyday and listen to what your coaches have to say. David Bromberg: My favorite stadium would be Great Lakes the Dodgers Affiliate. The Midwest League All-Star game was there last year and I loved playing there. Also, I would say Hammond Stadium where the Fort Myers Miracle play. It's a great place to pitch at and I love the mound and the fans. Josh's Thoughts: You've been named an All-Star several time. Has one meant the most to you more than another? What was it like to start the Florida State League All-Star game? David Bromberg: To start this year's All-Star game was sweet because of the fans being there and playing with all the prospects from each team. To become an All-Star you have to work hard and work at the things you aren't excelling at. I would have to say this year's All-Star game was the best because I got to start it. I wish I could have went more than 1 inning, but I had a regular start in 2 days. Josh's Thoughts: You lead all of the minor leagues in strikeouts last season, have you always been known as a strikeout pitcher? David Bromberg: I haven't always been known as a strikeout pitcher but I have been known as a power pitcher. I only threw 88-91 in high school and now Im averaging 91-92 and touching 93, 94, 95. But I was glad to get that title last year being known as, "The Strikeout King." David Bromberg: From now and until I get to Minnesota I need to work on my fastball command, going the distance more, and being consistent the whole year. I really want to thank David for taking the time to answer these questions. He's a helluva pitcher and will continue to turn heads. His hard work and dedication certainly looks to be paying off. This is the first Question and Answer I've done in a long time, so I hope everyone enjoys it. Alex Burnett has been a great presence throughout the Twins system since they drafted him in the 12th round of the 2005 draft. In Rookie Ball, Burnett looked to be an average pitcher with a combined 8-5 record and 4.06 ERA between the Gulf Coast League and Appalachian League. But since 2007, he has been anything but average as he holds a is 20-17 record with a 3.18 ERA between the Midwest League, Florida State League and Eastern League. 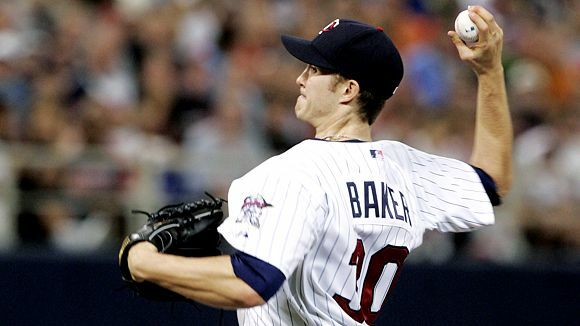 While racking up nearly 300 innings over the course of the 2007 and 2008 season, the Twins made the decision to move Burnett into the bullpen. While some may have questioned the move, Burnett has made the Twins' decision look genius. This season, Burnett is 3-3 with a 2.08 ERA in 38 relief appearances. He also made the jump from Advanced-A Ft. Myers to Double-A New Britain despite being only 21-years-old but hasn't lost any of his edge. Burnett's future - whether it be in the bullpen or in the rotation - may not be decided yet, but he'll likely handle both well while he gives the Twins a very talented arm. So without further adieu, lets get to the questions and (more importantly) the answers. Alex: I was for sure an Angels fan. For one, I live closer to Angel stadium and that's where my family took me to watch baseball games and because I always thought they were a better team. Alex: I played soccer my freshman and junior year and I stopped playing once I realized I had the talent to possibly go pro, so I stopped playing soccer and focused on baseball. Alex: I had a little bit of contact Twins scout John Leavitt. He would be at my games and he always had good things to say about me. Josh's Thoughts: You have had great success as both a starter and as a reliever. First, was there a reason for the switch? Secondly, which do you see yourself as long term? And finally, do you have a preference between the two? Alex: I think the reason that the Twins switched me was because they see me as a reliever in the future for them and they think I'll move up faster as a reliever. Long term, I can see myself as a reliever. I have really enjoyed it thus far and I hope I just keep doing what I've been doing. It's kind of hard to say I prefer one or the other because they are two different animals. In the bullpen you have to be ready at all times because you never know when you're going to pitch and once you're called upon to get hot, its really intense for me and I like coming in with runners on base and the adrenaline that comes with that. And as a starter you know what day you're gonna pitch so you have a few days to get mentally prepared. So I enjoy both, but I like what I'm doing now. Josh's Thoughts: What has been the biggest difference between coming in as a reliever and preparing for a start? Alex: Like I said, you know when you're day to pitch is as starter so you have the opportunity to prepare yourself to pitch, rather then when you're in the bullpen you can get called on at any point in the game. Alex: Well lately it has been my Cutter, but the majority of the time it's either my fastball or curve, I guess they're all my out pitches. Alex: My whole family they have supported me since day one and when I go out on the field I do it for myself and for my family. Alex: My favorite players growing up were Ken Griffey Jr. and Roger Clemens. I don't really have a favorite player anymore, I just like watching good baseball. Alex: To keep pitching well and possibly get a chance to pitch in Triple-A and to help what ever team I end up on win a championship. Alex: Well, I don't think a day goes by where there isn't some sort of music playing in our house and I like all types of music. I watch any movie that sounds good and that people say 'you have to see this movie.' We like to golf when we get a chance, haven't really had time to since being in Connecticut. Joshs' Thoughts:If you weren't playing baseball, what other profession would you want to be? Alex: I wanted to be a fire man for the longest time in high school, but I think I would become a teacher and coach baseball or any profession that keeps me around the game. Alex: Yeah, everyone calls me 'Ali' because everybody thinks I look like Muhammed Ali. And its not only my teammates that say that, I have had random people come up to me and say that I look like him, its pretty funny. Alex: Having a 3-year-old sister I guess would be shocking because of the huge gap in age, but other than that, nothing really shocking. Alex: Well, I was told I pitched like Juan Rincon a little bit, so I guess him. Alex: The most difficult part about pro baseball is not being able to be with your family. The best part is everything. I love everything about the game, traveling, being part of a team, meeting new people and the fans. 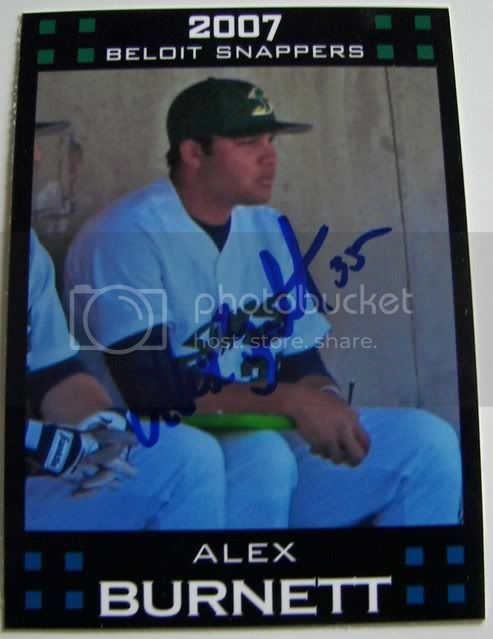 Alex: Getting drafted and winning CIF (California Interscholastic Federation) my senior year. Alex: I could use a little more work on controlling the bottom of the zone and just keep trying to perfect my pitches. Josh's Thoughts: Although you're dominating the Eastern League from the bullpen, what has been the biggest adjustment between High-A and Double-A? Which jump has been the hardest (rookie to low-a, low-a to high-a, etc.)? Any particular reason why it was harder? Alex: The hitters here in Double-A are a lot more disciplined and instead of having like 4-6 good hitters on a team in High A, in Double-A 1-9 can hurt you at anytime if you make a mistake with any of your pitches. The hardest jump I think was from Low-A to High-A just because the hitting is a lot better from Low-A to High-A. Alex: Just to focus on what he wants to accomplish and go for it because anything is possible and always work hard and listen to your coaches because they are the ones that are gonna get you where you need to be in order to play ball at a high level. Alex: So far its a toss up between the Daytona Dragons stadium or Altoona Curves stadium with the roller coaster behind the right field fence. And a special thanks to Alex for taking the time to answer a few questions. The Twins are lucky to have a pitcher like Alex who excels both on and off the field. He's a very cordial person and Twins fans will have a lot to like about him when he finally reaches Minnesota. La Velle E. Neal III of the Minneapolis Star-Tribune is reporting that the Twins have called up right-handed pitcher Kevin Mulvey from Triple-A Rochester while optioning catcher Jose Morales. Mulvey, who came over to the Twins for Johan Santana, is 3-6 with a 3.93 ERA this season in the Red Wings rotation. The first thing that came to my mind is that the Twins are showcasing him to potential buyers. It kind of stacks up with the Alexi Casilla promotion. Although that one made more sense, the Pirates are looking for a player to replace Freddy Sanchez and a couple pitching prospects. Mulvey doesn't figure to fit in long-term, so perhaps this could be a way for the Pirates to see him at the Major League Level. Listening to Chris Berman is already giving me a headache, and he's only been on for about...12 seconds. The Twins announced after Sunday's game that they have called up infielder Alexi Casilla from Triple-A Rochester while sending down Matt Tolbert. Casilla was pulled out of Sunday's game after hitting a first inning home run. He hit .340/.379/.449 this year in Triple-A Rochester with nine extra-base hits and nine stolen bases in forty games. He continued to show some struggles on defense, but as long as he plays hard, I'm sure Gardenhire will keep him in the lineup. Tolbert saw more time than needed in Minnesota, playing in 48 games while racking up 129 at-bats. He hit just .178/.272/.225 while getting spot starts at both shortstop and second base. Tolbert's hustle didn't amount to much production on the field. Tolbert is what he is. He's a light hitting utility player who is on the verge of being a Quad-A player and a backup player, but having him hit second more than he hit anywhere else is beyond absurd. And being that Ron Gardenhire is a "go by the splits/numbers" guy, why not bat him eighth? Tolbert hit .289/.372/.368 in that spot. Although I doubt it was a pressure thing (since he had terrible numbers batting ninth), he had no reason to be batting second. La Velle E. Neal III of the Minneapolis Star-Tribune suggests that Casilla being promoted is an indication that the Twins will not be able to pull off a deal with the Pittsburgh Pirates for All-Star second baseman Freddy Sanchez. While he has more information than any of us, and I value that opinion, that may not necessarily the case here. If the team can get him to show even flashes of what we saw in the first-half of the '08 season, they could boost his trade value immensely. While we know the Twins would probably want to hold onto him (for money purposes as he's still cheap), it's known that he's been in Gardenhire's doghouse on several occasions and could benefit both himself and the team from a change of scenery. The Twins may also find out for sure if they need to pull the trigger on a trade for (lets say) Sanchez if Casilla struggles. The Twins know second base is an area of concern and an area that needs to be addressed if the team intends on making a push for the playoffs. The Pirates could also be asking the Twins to call him up at their own request. Casilla has been mentioned in many speculated rumors (mostly amongst fans) and would likely be apart of any trade for Sanchez. The Pirates may want to see him up at the Major League level instead of the minor leagues where it's harder to get a proper evaluation. Casilla's chances are dwindling, but I think that regardless of how he performs, his days in Minnesota could be coming to an end. Both Tyler Ladendorf and Danny Rams were both promoted from Elizabethton to Beloit where they will try to help get a struggling Snappers team back on track. The two were a tandem wrecking crew, feasting on Appalachian League pitching. Danny Rams was drafted by the Twins in the 2nd round of the 2007 draft. He has struggled making the transition from High School baseball to professional baseball, which has been apparent with his .240 average and .703 OPS in his first 166 plate appearances all in rookie ball. He has a home run swing, but he doesn't make good enough contact to really get good 'pop' on the ball. Rams has not earned a promotion to the Midwest League, but he needs to play to get better and sending him to a full-season team could be beneficial. He's still only 20-years-old, so there's no reason to think he can't someday live up to the hype that followed him out of High School. Despite having a strong arm behind the plate, Rams probably will be permanently moved from behind the plate to first base or designated hitter at some point in the future. With Wilson Ramos and Drew Butera known as excellent defensive catchers, and with a guy named Joe Mauer winning a gold glove for the Twins from behind the plate, Rams probably won't make it to the majors as a catcher. In just his first game with the Snappers, Rams went 1-3 with a double, walk and two strikeouts. The double came in the eighth inning which sparked a six-run rally to eventually beat the West Michigan White Caps, 9-8. Ladendorf went 0-4 with a strikeout in his first game with the Snappers. Both players have great potential will undoubtedly make big strides on my next prospect list. To make room for them, catcher Alexander Soto was promoted to Fort Myers. Soto was hitting .240 with a .702 OPS with the Snappers. Taking Rams' place behind the plate in Elizabethton will be Buddy Monroe. Monroe was drafted in the 22nd round of the '09 draft out of the University of Florida. He was the third Gator selected by the Twins in the draft. UPDATE: Glen Perkins is sick, so Anthony Swarzak will start for the Twins tonight. I know that saying this may sound cliché, and saying it sounds cliché may be cliché (still with me), but this is a really important series for the Twins. The Twins have repeatedly missed staff aces like Yovani Gallardo of Milwaukee, Chris Carpenter of St. Louis, Zach Greinke of Kansas City and Justin Verlander of Detroit but won't be so lucky the last two series heading into the All-Star break. After facing C.C. Sabathia last night, the Twins will face A.J. Burnett and Sergio Mitre before playing host to the White Sox and their three-headed Southside monster of John Danks, Gavin Floyd and Mark Buehrle. Last night, Scott Baker was very inefficient as he struggled with his command through three innings. Brian Duensing was the same. R.A. dickey threw well, but the game was already out of reach by the time he even thought of warming up. The team again came out with a losing attitude as if they already knew they were going to lose, allowing Sabathia to do what he wanted with no contest. The Twins failed to get in his head early, even when they knew how. The Twins failed to lay down bunts which I'm sure is a main reason why they went with the speedier Carlos Gomez over Jason Kubel in the lineup. The Twins had a great chance to attempt some bunts with speedy 8-9-1 hitters in their lineup, but failed to do so. The Twins will try to salvage the series tonight while they face Burnett who is 5-2 with a 1.88 ERA in his last seven starts. Glen Perkins has been great in his own right as he's 3-1 with a 2.66 ERA since coming off the disabled list on June 16th. They'll have their work cutout against them, but hopefully they come ready to play today, which I think is what hurt them yesterday. Interesting stat: In the past five games, the Twins have 15 walks. Nick Punto has 7 of them. Hate disappointing losses like this. Especially when it will cost starter Kevin Slowey a trip to the D.L. with what is (now) being called a 'strained wrist'. Anthony Swarzak will be up here for Saturday's game and will pitch out of the pen for a couple days until he takes Slowey's place in the rotation. But let's come back and get them tomorrow later today. Yesterday marked the beginning of the International signing period in which players not from the United States, Canada or Puerto Rico can sign with ball clubs. The one player everyone is interested in hearing about is Miguel Angel Sano. Major League Baseball is still investigating his true age, so any deal probably won't be done until next week at the earliest. But moving on to players the Twins can sign, they've been linked to Jorge Polanco who doesn't turn 16-years-old until Sunday, meaning any deal until then cannot be agreed upon. The supposed signing would be for about $700,000. Polanco is considered to be the 23rd best Latin American Prospect. The Twins are set to sign shortstop Jorge Polanco with a bonus of $700,000. He is ranked as the 23rd best Latin American prospect. But I doubt it effects their efforts on signing Sano as Sano's likely projected long-term as an outfielder or third baseman. On another note, according to Keith Law, the Twins have signed European prospect Max Kepler who is considered by many to be the best European prospect this year. Kepler is listed at 6'4'' and 180 lbs. He's just 16 but many believe he'll someday possess all five tools. He also bats and throws left-handed. The terms of the deal haven't been disclosed, but I doubt that the addition of either of these two players will play any part in the team not signing Sano. Although Sano and Polanco are both shortstops, Sano is believed to be a third baseman or right fielder long term and with players that age, nobody should care about position anyways. If the Twins are serious about signing Sano, which by all indications they are, then these deals will play no part against them signing him. But it will certainly help ease the pain if their bidding for Sano goes unsuccessful. The Twins and Pirates have been linked together quite a bit in recent weeks. Probably most notably (at least up to this point), the two teams are reported front-runners to ink the (believed) 16-year-old shortstop phenom Miguel Angel Sano. Sano has reportedly fielded offers from both teams but won't sign with any club until Major League Baseball is finished investigating his true age. The two teams also faced each other in Interleague play for the first time since 2006. The Twins beat the Pirates two games to one. When the Twins designated Luis Ayala for assignment, La Velle E. Neal III of the Minneapolis Star Tribune reported that the Pirates were at one point interested prior to shipping Eric Hinske to the Yankees. Ayala later signed with the Florida Marlins. And now, the Twins and Pirates are reportedly engaged in trade talks that would send Freddy Sanchez and possibly two relievers to the Twins for what can only be believed is a slew of prospects or young, cheap players in return. The Twins have really never been considered "big buyers" at the trade deadline, but this could certainly begin to alter that perception. While Freddy Sanchez is far from a C.C. Sabathia or Manny Ramirez, but in Twins-terms, adding a player like Sanchez would be a monumental change from past years where they've generally sat silent and not gotten into bidding wars for players in which most are only considered two month rentals. With Sanchez, that situation is somewhat different. Not only is the 31-year-old second baseman having one of the best years of his career, but he also has an option for next season, meaning he does have a little more value to his potential future team. The Pirates have been a known seller this season with trades of Nate McLouth and Nyjer Morgan, which have rightfully upset many of the current Pittsburgh veterans. While players like Andrew McCutchen, Gorkys Hernandez and Lastings Milledge have potential, many of the older players are aware that they'll never see future success with the club as they're still in the middle of rebuilding the ball club. And while they've busted their rears for a ball club that is not focused on winning, it really rubs off the wrong way. That means players like Sanchez and relievers John Grabow and Matt Capps, who are all being linked to the Twins, are hearing speculation about being available while the Pirates undergo in a league-known fire sale. Sanchez, as mentioned, is a 31-year-old second baseman. He has an option for the 2010 season that vests if he reaches 635 plate appearances, or 600 plate appearances with an All-Star appearances (which could happen as each team has one representative in the All-Star game, which I like to call the "Ken Harvey Rule"). The option is worth $8 million, which is probably a little more than the Twins would like to spend, but with contracts for Ayala, Joe Crede and (finally) Mike Lamb coming off the books, it's not out of the teams price range, especially as they move into Target Field. One thing that separates Sanchez from other players that the Twins are usually linked to is that his career home/away splits are nearly identical. While those splits are close, another set of splits reveal something a bit different which isn't actually a bad thing. Despite being ninth in the Majors with a .279 average against southpaws, their .751 OPS ranks 16th. While Sanchez isn't going to really provide any sort of sustained power, placing him second in the order, wedged between several left-handed hitters, should pay off well for the Twins. Sanchez, in my opinion, is compared to a rich-man's version of Brendan Harris. Although that comparison probably doesn't make sense on the surface, they are fairly similar players. Both provide adequate power while mainly making contributions with solid gap-power. Sanchez is better at making contact, but that's why I called him a "rich-man's version." Another comparison that I find to be a bit more consistent is their versatility. While Sanchez's primary position is second base, he has also logged considerable playing time at third base with some at shortstop. Harris' primary position is shortstop with considerable playing time at both third and second base as well. Sanchez's defense probably will never win him a Gold Glove, but in comparison to what the Twins have had at second base this season (ie Alexi Casilla & Matt Tolbert mostly), his defense will be a huge upgrade. The other players mentioned in the rumor are left-handed reliever John Grabow and current Pirates closer Matt Capps. On the season, Grabow is 3-0 with a 3.75 ERA in 35 appearances. With Sean Henn back in Rochester and Brian Duensing getting another chance at grasping a left-handed relief spot in the bullpen, the need for a stable second southpaw is evident. Capps has struggled for much of the year but has a career 3.27 ERA and at 25-years-old, he's under team control until 2012 which makes him less-likely to be moved. Grabow on the other hand is a free agent after the season but will likely qualify as a Type-B free agent, if not a Type-A. That and Twins' need for a second left-hander makes the thought adding Grabow more enticing. There's no question that the bullpen and second base are still two areas of concern for the Twins, although the bullpen has vastly improved, the fact that the Twins are linked to the best second baseman and two good relievers may just be because it "seems right." While I think adding Sanchez, Grabow and/or Capps would be great, the price may be too much for the Twins to handle. The Twins would probably be looking to trade Delmon Young, although the Pirates do have one position of strong depth in their system, and that is outfield. I don't think Young would be the best fit, but I'm sure if presented him, the Pirates probably would still take him. Alexi Casilla would probably be apart of the trade, as his services in Minnesota would no longer be needed with Sanchez aboard making available. I'm sure the Pirates would be mostly looking to add pitching. Anthony Swarzak's name would probably be the first player the Pirates target, but I don't know if the Twins will trade him. Jesse Crain would make sense on the Twins behalf, but I don't know why the Pirates would want him. Another player I could see the Pirates asking for is Anthony Slama. Slama has been held back from some strange reason, and if the Twins aren't set on promoting a 25-year-old reliever to Triple-A yet, they probably would be open to trading him, despite his still-promising future. The Twins aren't used to indulging themselves in the bidding wars of the trade deadline, at least not at this level, so the thought of trading such promising, young players as Swarzak, Slama and Casilla may not sit well with many, but it's probably what the Pirates would demand. Thankfully, we're still nearly an entire month away from the actual day-of-the- deadline, so the Twins probably won't have as much competition for any of these players compared to if they waited even two weeks from now. Like every rumor, especially those that pop-up in July, need to be taken with a grain of salt. While I believe that this could be a great move for the Twins, I'd still be surprised to see anything actually happen with this. For that reason, we just have to play the percentages in that probably 1% of all rumors never pan out. Not to say the teams aren't talking, but the art of working out a trade has so many loops and turns that it is very difficult to actually make both sides agree to everything. For that reason, the Twins' reluctance to generally trade any of their prospects and the high price of relievers (especially) and one of the best commodities involved in the trade, I'd be surprised to see this worked out. I'll hope, but all that generally leaves is me upset and disappointed.